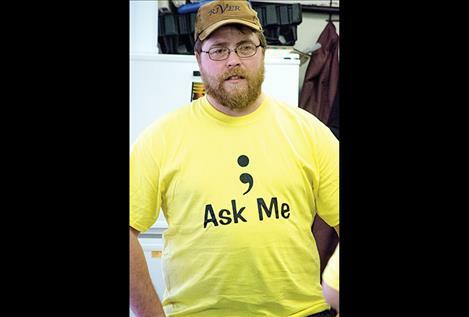 Army veteran Justin Blevins wears one of the "Ask Me" shirts created by the Your Life Matters Project volunteers to bring awareness to suicide issues. Army veteran Jeff Newton talks to other veterans during the event. The back of the YLM's shirt encourages people to ask volunteers about resources to help prevent suicide. When Sarah Dumont talks about the number of military veterans dying by suicide, it brings tears to her eyes. Dumont is part of a local group that started a few years ago, called Your Life Matters Project (YLM). The volunteers work to raise awareness about the issue of suicide in communities across Lake County. The group also develops projects that bring people together for fun activities allowing them to socialize and create support systems. Statistics on suicide reveal that veterans are at an increased risk for suicide compared to their non-veteran peers. The U.S. Department of Veterans Affairs reports that an average of 20 veterans die by suicide each day. Veterans account for 18 percent of all suicide deaths among U.S. adults. The Department of Public Health and Human Services reports the veteran suicide rate in Montana is even higher than the national rate - accounting for 22 percent of all suicides among adults. Between January of 2014 and March of 2016, Missoula County had the highest number of veteran suicides in the state at 18 deaths. Lake County is in the top four with eight deaths in that same time period. 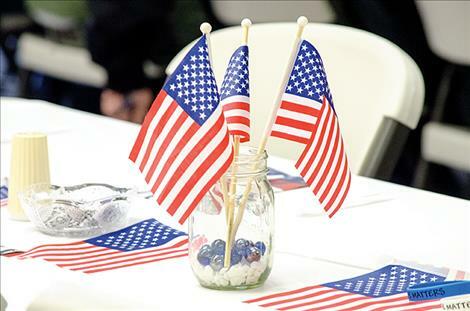 YLM volunteers wanted to do something to honor veterans, active military members, and their families, and bring awareness to the issue of suicide, so they decided to host a breakfast. 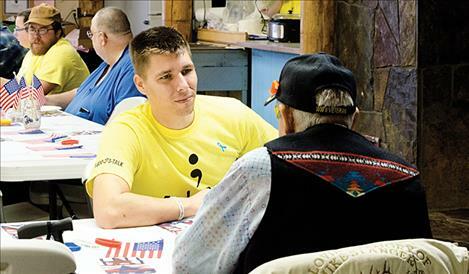 The event took place on Saturday morning last week at the Ronan Tribal Senior Citizens Center. During the event, people ate as much biscuits and gravy, bacon, eggs and fruit as they could handle and drank as many cups of coffee as they wanted. A long table full of veterans talked about everything from the weather to old war stories. Suicide prevention information was on another table for anyone that wanted it. 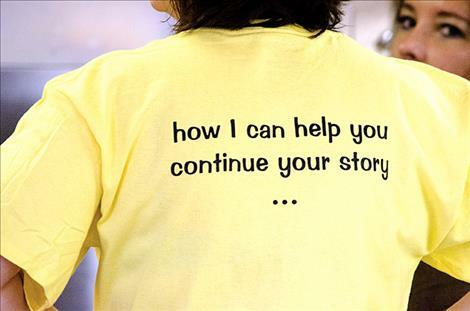 YLM volunteers wore their signature yellow shirts with the semi-colon on the front - symbolizing the continuation of a sentence and a person’s life story. Army veteran Jeff Newton of Polson, who continues to serve in the National Guard, was also wearing one of those yellow shirts as a volunteer at the event. He brought World War II veteran Francis Stanger a cup of coffee and they exchanged stories. Newton said military experience and war stays with a person for a lifetime, and it’s helpful to talk to someone who understands the experience. Newton decided to volunteer to help with the breakfast and other programs supporting veterans because he knows what it feels like to think about attempting suicide. His wife, Cora Coleman, noticed when he was struggling. He was dealing with things he experienced while serving in the military and the deaths of three of his friends by suicide. Newton said his wife locked up all the firearms and found a counselor. “I wouldn’t be here if it weren’t for my wife,” Newton said. After utilizing veteran’s services, he realized that reaching out to others was much better than suffering alone. Now, he hopes to help other veterans the way his wife helped him by offering resources and supportive conversation. Using his own experience, Newton has a theory as to why a large number of veterans experience suicidal thoughts. He said military service and combat change the way a person thinks about death. Newton also thinks that Montana has a high rate of veteran suicide because many military service members move to the state for the rural outdoor lifestyle. He prefers the quiet outdoors where he can practice the survival skills he learned in the military. Army veteran Justin Blevins was also wearing a yellow shirt and volunteering at the event. He set out a clean set of forks and spoons for the next wave of veterans making their way through the breakfast. Blevins said he volunteered because he too knows what it feels like to have suicidal thoughts after serving in the military. “You come out feeling like you don’t have a purpose anymore,” he said. He added that military service gave him a sense of belonging and camaraderie. After serving in the military, Blevins experienced medical problems and endless pain. Suicidal thoughts started invading his mind. He grabbed onto the one positive thought in his mind at that time. When two of his military buddies died by suicide, it reinforced to him that suicide wasn’t the answer. The experience was extremely painful, and allowed him to feel what friends and family experience when someone takes their own life - what his family would have felt if he had made that choice. The experience inspired him to get involved with veterans programs to help other people. Veterans of wars spanning as far back as the 1940s sat at tables decorated with American flags at the event. Many stayed to reminisce over cups of coffee. Members of the Ronan Veterans of Foreign Wars attended the event including Gary Hoffer, Jack Fay, Ed Cornelius, Ted Decker, Dale Morgan and others. Members of the group said that suicide is something that affects all branches of the military and every generation. They said that it would be accurate to say that everyone in the military has known someone who has died by suicide. Members also said they would hope that someone would seek medical attention through Veterans Affairs if they were having thoughts of suicide, although, they added, the waiting list to see a doctor can sometimes take months. 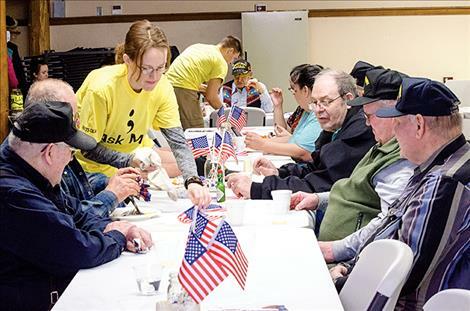 They encouraged veterans to seek out the VFW in their area and sit down for a cup of coffee to talk to people who understand what they’ve been through. The Veteran Crisis Line is another resource for Veterans in crisis, their families, and friends to receive confidential support 24 hours a day at 1-800-273-8255 or www.veteranscrisisline.net. The U.S. Department of Veterans Affairs has another help line that is confidential and around the clock with a staff comprised of combat veterans from several eras. That phone number is: 1-877-WAR-VETS.